Examples & Explanations study guides. Many of these study guides are available at the Mendik Library and via Google Books. Often, a large portion of the text will be available via preview on Google Books. Access helpful LexisNexis Publishing study aids, including the popular Understanding Series as well as the Questions & Answers Series. Borrowing is via the OverDrive platform. These may be accessed via your NYLS network login or by signing in as a campus guest. Read content in a web browser or download to an e-reader app. New York State Bar Exam (NYS Board of Law Examiners): Past Exam Essay Questions with Sample Candidate Answers (2005-2017). The sample and practice exam archive consists of exams released to the Library by NYLS faculty. Please note that professors are not required to release exams to the Library, and many choose not to do so. Consequently, you may not be able to find an exam for either your class or your professor. Sample and practice exams are indexed by professor’s name and course taught. All exams are in Adobe PDF format and are viewed using the free Adobe Acrobat Reader, which has been installed on all PCs in the Library and the Electronic Research Classrooms. Paper copies of sample and practice exams for the current semester only are kept at the Circulation Desk. The exam archive is maintained by the Circulation Department. Questions regarding available exams should be directed to Elina Oyola, Circulation Librarian, at 212.431.2148, or by email at: elina.oyola@nyls.edu. The CALI Library of Lessons is a collection of over 1,000 interactive, web-based tutorials written by law professions and geared toward law student. Each lesson focuses on a specific aspect of a legal topic, asks questions in a variety of formats and then provides immediate feedback. Lessons may be viewed and run in your web browser. Please note that you must register to use CALI lessons. Registration will allow you to create your own password to use the lessons. In order to register, you will need an authorization code, which can be obtained by contacting the Mendik Library Reference Desk (email: reference@nyls.edu). CALI also offers an index of lessons by casebook. See if your casebook is available. Then click your casebook to see which lessons correspond with specific pages in the book. CALI also offers a Lessons By Subject Outline index which matches up traditional subtopics within courses to the corresponding CALI Lessons. 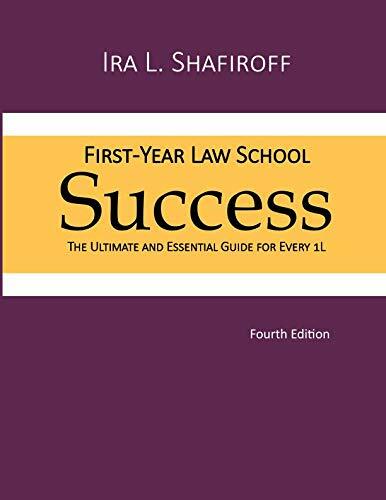 The first year of law school is, for many people, one of the most significant transitions of their adult life. Law school demands a lot as it helps you make the transition from your prior identity as student (or as some other occupational role) to your new identity as an attorney. To meet the demands of law school, it is often helpful to have the big picture before you begin – a sense of what it is you are trying to do as you prepare for classes, participate in those classes, review and prepare for exams, take exams, and then begin the cycle once again.Law School Materials for Success is designed to give you the essentials of that process. These series contain multiple choice questions designed to help students practice for law school exams.